From July 1 until July 3, 1863, around 50,000 soldiers were killed during The Battle of Gettysburg in Pennsylvania, USA. 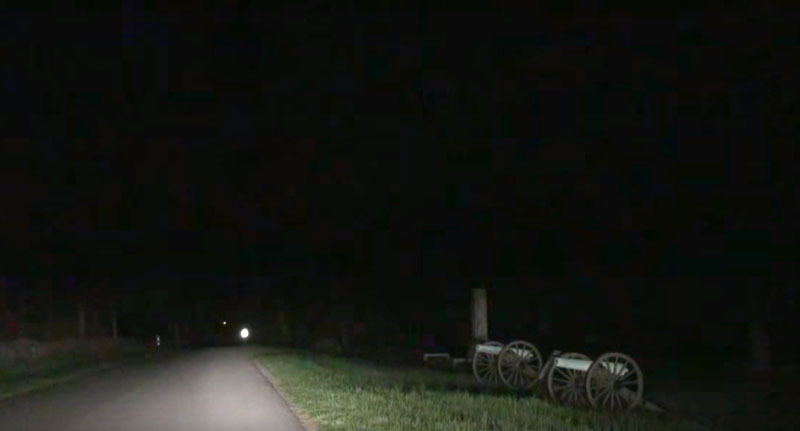 It was the American Civil War’s biggest loss of men and is now widely regarded as one of the most haunted battlefields in the whole world, making it a must-see location for countless ghost hunters. This video was recorded back in 2013 but after being posted on Reddit, it has gone viral all over again, and it’s easy to see why, reports the Daily Star. Now, I’m a sceptic and I wasn’t expecting the ghostly apparition in the video to be as clear as it is, so it’s either set-up and entirely faked or it’s legit. Either way it makes for one hell of an eerie video. Essentially, this clip is the moment two ghost hunters headed to the battlefield in an attempt to get something spooky on tape. The footage begins as they are driving to an area where some ‘activity’ has been rumoured and they decide to wait there for a while. But after just 20 minutes, a transparent figure emerges from behind a cannon and limps forward towards the car where the two men are sat. Just as quickly as it appeared, the apparition vanishes into thin air leaving the two men and commenters across the globe utterly mystified.